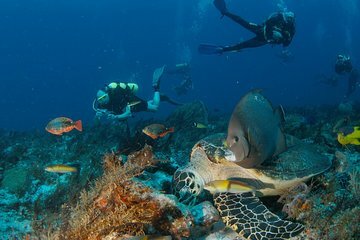 Dive the spectacular coral reefs off Playa del Carmen on a 2-tank dive trip that includes a deep dive and a drift dive. You'll descend to the coral reef at two different sites and depths, enjoying a 40-minute surface interval aboard the dive boat. With both morning and afternoon departures available, this 2-tank dive is great way to experience the gorgeous reef, fish, and wildlife of the northern hemisphere's largest reef system.